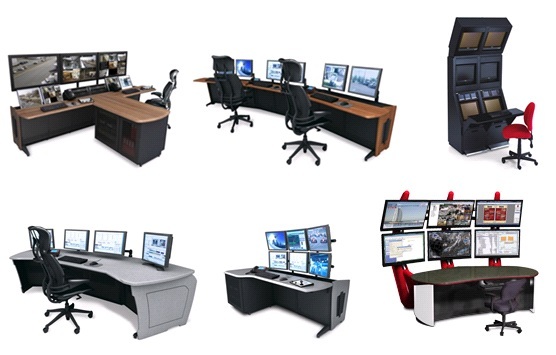 Console furniture optimized for security command centers is typically required for surveillance systems installations of 50+ cameras. Those sites regularly have a trained security operator or staff to view live and recorded video and manage access control, intrusion and other systems. As an introduction to surveillance systems furniture design for these larger, constantly attended systems, we’ll review some basic concepts of console furniture layout and review a few example layouts dedicated to video surveillance systems to compare pricing. In a future article, we will delve deeper into using console furniture manufacturer’s design software to develop custom applications with specifications and estimated pricing. Generally, smaller systems of 32 cameras or less do not require any special furniture as all of the cameras can be displayed from a PC with several monitors (or one large monitor), which can be easily integrated into COTS office furniture or building lobby entrance security desks. In this article we will be focusing on larger installations that may require specialized surveillance console furniture. Developing a budget for the security console furniture. How many operators will be working in the area? Besides video surveillance, are there other system’s workstations, monitors, and equipment that will need to be incorporated into the furniture layout? How many video surveillance monitors will be required and how many cameras will need to be displayed simultaneously? IVPM did an article on monitor layout that is useful in determining monitor requirements. Will the video servers, DVR’s, NVR’s, encoders, network switches and other surveillance or security hardware need to be incorporated into the console furniture, or will they be located in a separate location or equipment room? How much storage will be needed for other equipment and supplies? Will any shelves or drawers be required for security logs, operations manuals or files? Review the different styles of console furniture available, they can range from simple to quite extravagant. Determine desired colors and finishes of the furniture. Console furniture manufacturers will generally provide samples upon request. While using low-cost commercial office furniture from someplace such as Office Depot or Costco might be attractive price-wise, this type of furniture isn’t designed for video surveillance purposes. Low-cost office furniture generally uses laminated particle-board or compressed wood, as opposed to the steel structures of technical console furniture. 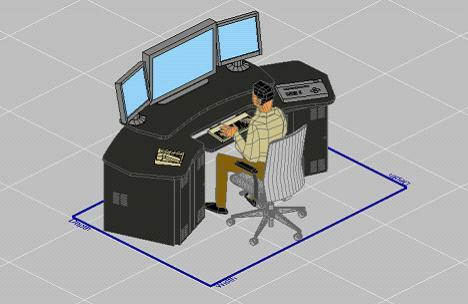 This type of furniture is usually not very ergonomically designed and does not include features such as concealed wiring, available rack space for equipment, different configurations for small and large monitor mounts, nor do they hold up to the rigors of the 24/7/365 working environment of a modern security command center. Inexpensive office chairs also generally lack the ergonomic design and seat, back, and arm support needed for continuous-duty use. Low-cost office furniture should only be considered for smaller surveillance systems that are not monitored or manned continuously. Using more upscale COTS commercial office furniture such as that manufactured by Hon is more durable but has similar issues with ergonomics and integrated features, and can cost almost as much as technical furniture designed for surveillance. The console furniture of today incorporate features such as built-in 19” equipment racks, cabinets with slide out drawers for workstations, ergonomically designed keyboard and many different styles of monitor mounts as well as integral cable management systems for a clean appearance. 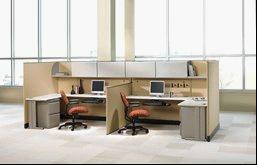 Many furniture systems use modular sections that are pre-assembled for easy installation. This example is typical of a medium sized DVR/NVR based surveillance system that might be found in an office building or manufacturing plant. This is a fairly simple design using a wrap-around media desk with built in rack space in the base for the DVR’s, network switch on one side and slide-out workstation on the other. This console features two rack bays at the base with pre-punched 19” rack rails, integral cable management, an elevated monitor stand and slide out key-board drawer. Locking rack front doors and a cooling fan were added. MSRP of the console furniture with the ergonomic chair is approximately $6,000, not including the monitors or surveillance hardware. In this example, a Winsted Sight-Line Command Console was designed for two operators which may be typical for a courthouse, hospital or shopping mall enterprise level video surveillance system. It is assumed that the video servers, NVR’s network switches and associated hardware would be in a separate location. 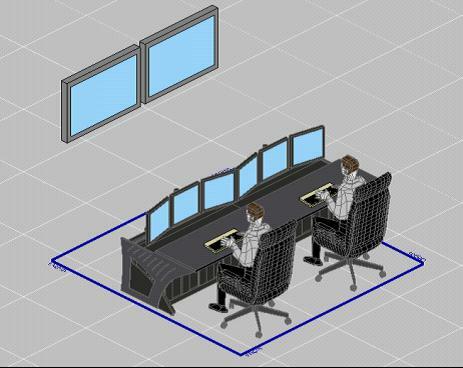 Two additional large screen monitors could be added to display additional cameras. MSRP for the console furniture in this example, including the chairs is about $12,000, not including the monitors or surveillance hardware. Pictured above: dual operator console setup. This example is for a large-scale enterprise VMS system that might be found in a casino or large airport, using the same console furniture as the previous example for an equal price comparison. As before, we will assume that all of the video surveillance hardware is in a separate location. MSRP for the console furniture in this example, including the chairs is about $75,000, not including the monitors or surveillance hardware. It is important to note that the pricing of console furniture installations can vary greatly depending on the manufacturer, style, model, complexity and options selected. When working within tight budgets, several designs or iterations may need to be evaluated by the customer prior to purchase and installation to fit the budget and operational requirements. The examples shown in this article are just a few examples of typical types of installations. In a future article we will review using different manufacturer’s layout, specification and estimating software applications to enable designers and integrators to develop specific designs specifically suited for their clients.